Need a relaxing holiday, come with Keitaro, and his slew of lovely manga women. This second installment of Love Hina is one not to miss, it has great presence and the manga well out does the first. 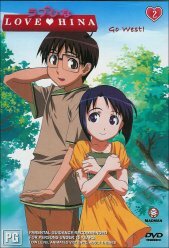 If you�ve seen the first Love Hina the story line will be much easier to follow, there isn�t much of a reference to people's personalities or even their names so make sure you have seen number one. If this had been the first time I had seen Love Hina it would have been a little hard for me to pick up people's names, what they are doing and why. Upon failing his entrance exam again, Keitaro finds himself very depressed and run down, Time for a holiday. Though no one knows Keitaro and Naru have taken an unexpected holiday from everyone, and each other. What they don�t know is that they are both going to the same place, a holiday brochure was left lying around the apartments and off they went only leaving notes. When the rest of the house receives two separate calls stating that they had gone away for an extended holiday they assume they are together. Alas that is not the case Keitaro and Naru do have the hots for each other a little bit, but none of them want to admit it, when they arrive to the train station Keitaro and Naru bump into each other knocking each others glasses off, Keitaro being clumsy he falls on both glasses and the pair are blinded. Finding new friends, or so they think, Keitaro and Naru go on all their holiday expeditions together and fall deeply enthralled with each other, always thinking about how well they are being treated by their new counter part, not like that horrible Keitaro. To their amazement when their glasses are repaired they see Keitaro and Naru standing in front of them, but of course poor Keitaro get the brunt of it as always. The story proceeds to their rescue by the other house mates and Keitaro is also met by a new friend, girl of course but this one thinks he is cute and kisses him. The animation is drawn on a whole other level on DVD number two, they have stayed (most of the time) from the badly drawn action shots and put a whole lot more effort into the final product, or so it seems. Extras are very similar to the first character drawing, madman propaganda, Keitaro song book (the words to the extra songs during the DVD) and the DVD credits.